One of the great things about making is a roast is, well, it roasts. In other words, hands-on time is pretty minimal because you put it in the oven and, while the oven does the work, you’re free to do whatever. That’s one of the reasons I like making roast pork, but also other roasts like chicken, leg of lamb, and roast beef. But when I want to do a little something more special, I pull out this recipe. It features one of my favorite flavor combinations—rosemary, garlic, and lemon. 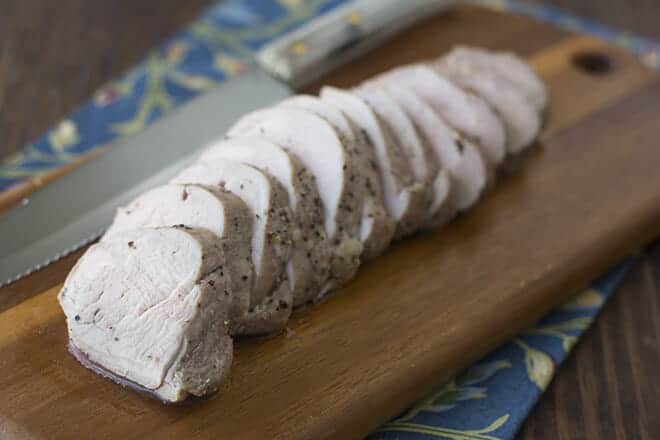 Those ingredients are turned into an easy-to-make paste that gets slathered onto a beautiful pork loin. It only takes a few minutes to make the paste, and it adds a TON of flavor. 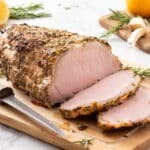 Before we go much further, let’s talk about the difference between a pork loin and a pork tenderloin. The names are similar so they’re easily confused. 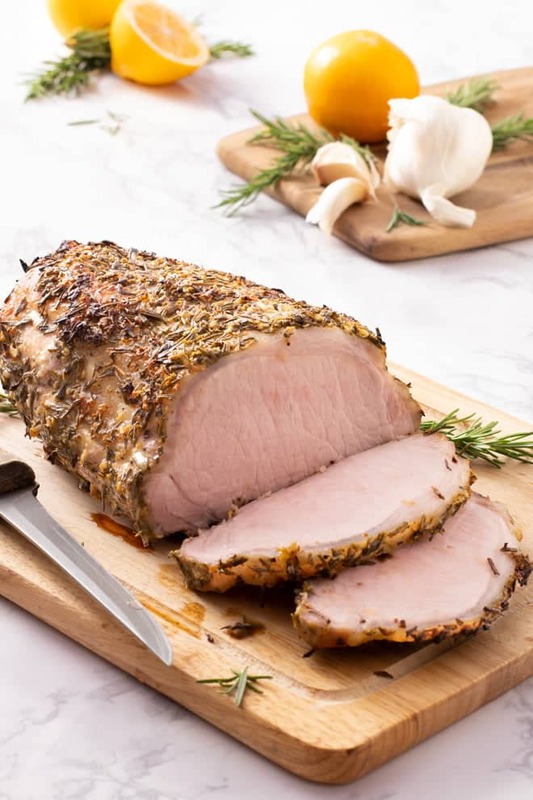 Basically, a pork loin is a pork rib roast without the ribs. 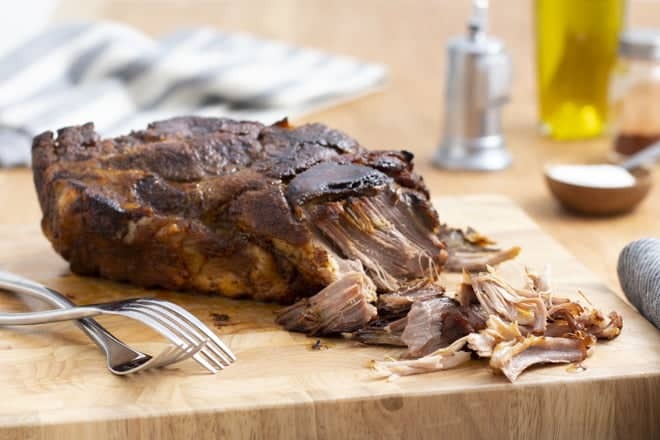 It ends up being a long cylindrical piece of meat that’s about 4 inches in diameter and can weigh up to 8 or 10 pounds, although it’s often cut into pieces that are anywhere from 1 to 5 pounds. 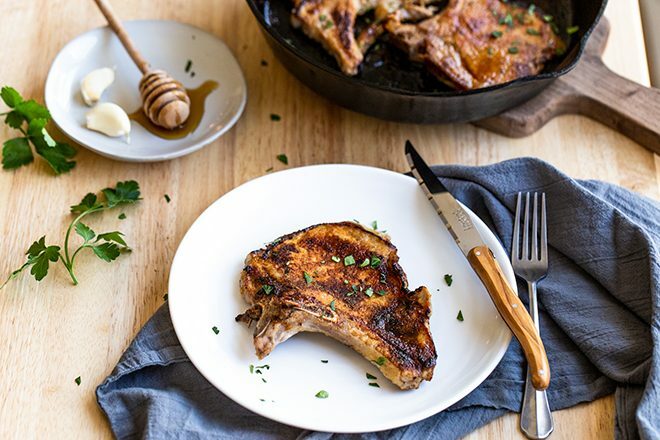 A pork loin is also used to make boneless pork chops—by just cutting the cylinder into thick pieces crosswise. A tenderloin is also a cylindrical piece of meat, but it’s much smaller. It only weighs about a pound. Because it’s so much smaller, a tenderloin won’t cook the same as a loin, so they’re not interchangeable in recipes. Here’s a little more about the difference between the two from the National Pork Board. Okay, back to our recipe. To make the flavorful paste that coats the meat, I use a food processor. The benefit of that is I can use tons of fresh rosemary and garlic without having to do a lot of chopping—because the food processor chops it all up for me. Hooray! I think the paste is a perfect balance of earthy, herbal, and bright. But because it’s so easy to make, it’s easy to experiment with more or less rosemary or garlic, or even adding other herbs. You can even use the paste on your other favorite roasts. Or chops. Or filets. Zest, then juice the lemon. In a food processor, combine the lemon zest, lemon juice, rosemary, garlic, olive oil, salt, and pepper and pulse until it becomes a coarse, wet paste. Spread the paste all over the pork. 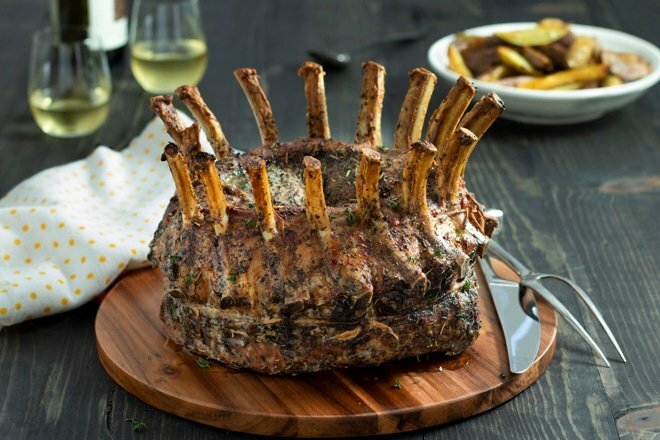 Put the pork on a rack in a roasting pan fat side up. If you don’t have a rack use about 3 stalks of celery arranged in the pan. Slice the roast and serve immediately. For even more flavorful meat, brine the pork before you roast it. But if you do, cut the salt in this recipe to a little more than 1/2 teaspoon. See this post for how to brine and why it makes such a difference.